Indiana University Kelley School Of Business graduate Derek Pacque’ took his startup CoatChex in front of fellow Indiana University alum and ABC Shark Tank Shark (and Dallas Maverick’s Owner) Mark Cuban on the season premiere of Shark Tank Friday evening. Pacque’ has a great concept. 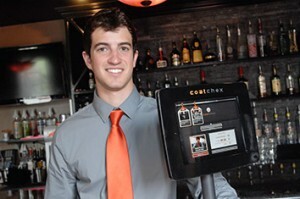 CoatChex is a system that uses pictures to match customers up with coat checked items. His current technology is boxed up in a device that’s about the size of a Verbatim credit card reader. Now, instead of using an old fashioned ticket redemption system for coat check, it’s done with technology where pictures of someone’s face are tied to their items. It’s safer, greener and easier to use. Pacque’ explained that CoatChex isn’t just about coat checks though, it’s about any “bailment” system. Bailment is when you charge someone else with taking care of your stuff, like coat checks, valet parking,dry cleaning, baggage holding services and other similar services. Pacque holds a patent on using technology for these bailment businesses. The 2012 graduate hasn’t sold anything yet, which was of course a complete turn off to Kevin “Mr. Wonderful” O’Leary. In the beginning of the segment, Cuban didn’t seem very interested in the fact Pacque’ hadn’t sold anything yet. Cuban called Pacque’s idea “horrible” over five times. It looked like things were going to turn around though after Pacque explained that CoatChex wasn’t just about coats. Pacque went into the Shark Tank looking for $200,000 for 10% equity in his company, valuing it at $2 million dollars. O’Leary and FUBU founder Daymond John were the quickest out. Barbara Corcoran didn’t get the concept at all and bailed. Robert Herjavic and Cuban stayed in the longest but both were concerned about the value. Herjavic asked Pacque for a new offer and wasn’t pleased when the entrepreneur changed his valuation to $1.5 million dollars. Herjavic bailed. Cuban was still in and made Pacque an offer for $200,000 for 33% of the business. That’s where some may think Pacque’ went wrong. Pacque made a call to his professor and business partner who told him to tell Cuban no. Pacque’ told Cuban no. PacQue’ countered with 20% for $200,000. Cuban quickly said no. Before he walked away though he kept telling Cuban that he wanted more experience before he pitched again. While there’s a lot of drama in Shark Tank after all it’s a Mark Burnett reality tv show, however based on Cuban’s history with companies that he likes and the entrepreneur’s he likes I wouldn’t be surprised if Cuban turns around and invested CoatChex down the road. Florida Startup: EarlyShares Acquires HelpersUnite, Well, Early!